Ned Garver remains a winner. He hasn’t taken the mound since 1961. However, his new book Catch 20…too! How one pitcher won 20 games on a team that lost over 100 will be remembered as one of his greatest accomplishments. 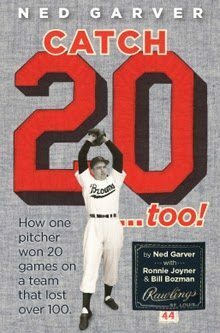 The fascinating 184-page book recounts how Garver won 20 games on a struggling St. Louis Browns club that lost 102 in 1951. Authors Ronnie Joyner and Bill Bozman have preserved an overlooked slice of baseball history. Together with pictures from Garver’s personal collection, this is a book that’ll stun even the brainiest baseball fan. Joyner and Bozman give a great recap of Garver’s season. “Ned’s Notes” allow Garver himself to offer detailed color commentary from every victory. He’s remembered it all, recapping conversations with teammates and foes. This isn’t fluffy encyclopedic stuff. Garver interweaves episodes from his entire career, comparing them to 1951. For instance, he tells about his regret over accidentally beaning Brooks Robinson in 1957. Conversely, Garver isn’t shy about sharing his feelings from 1951 over Larry Doby and Early Wynn (the latter being the avenger who delivered a retaliatory fastball message at the Brown hurler’s head). Perhaps, Wynn knew how dangerous Garver was as a hitter. He accented his 20-win achievement with a .305 batting average. The book’s end is priceless. Garver himself begins his memory of win 20 with, “If you were going to write a script for Hollywood, I think that scenario was as good as it gets:”. It’s a great story, told in all-star fashion by the man called “The Team” by St. Louis owner Bill Veeck. An introduction from Dodgers pitcher Carl Erskine and box scores from every Garver victory make this the perfect time capsule.